Be the first to hear about their new releases and deals. Download the Booksprout app and search for Tamyara Brown today! Tamyara admits her journey has not always been easy raising a family of six. She has face obstacles such as being a survivor of Breast Cancer, Domestic Violence and being homeless. Now taking care of a son who suffers from a rare Kidney disease Focal Segmental Glomersclersois and Nephrotic Syndrome.This never stop her from having tunnel vision and looking for the bright light ahead. She took her pen and began her writing career. 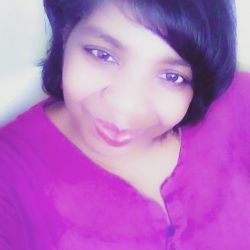 She has a short story and a poem, which has been published in a Domestic Violence Anthology VOICES BEHIND THE TEARS, her Blog was also featured as Blog of the Month in Writer's POV Magazine. American Cancer Society Anthology and her two poems are being published in the Homeless Cry. Her proudest accomplishments are releasing her novels with Pink Kiss Publishing Company Blue's Treasure and Fat Girl Vigilante. Tamyara currently resides in Buffalo, Ny with her beautiful children.